These custom head gaskets are built to order, and available in a hurry! All gaskets are Multi-Layer-Steel (MLS) and feature a Viton rubber coating to ensure proper sealing and easy removal. Fits either side of engine. All of our Head Gasket designs have been altered to allow the removal of your Lifters without the need for removing your heads. This is an extremely important feature for cars running aggressive profiles and high spring pressures. The ability to replace lifters without head removal is worth over 10 hours of labor and $300 in gaskets for each occurrence of head removal this feature saves you. Included at No cost. For reference, OEM Head Gaskets have a bore of 4.03, and a thickness of .053, we recommend a 4.030x.051 if you are looking for a simple factory gasket replacement. *Available in a variety of thicknesses to suite - just call us. Dodge factory OEM replacement head gasket. Fits both sides. 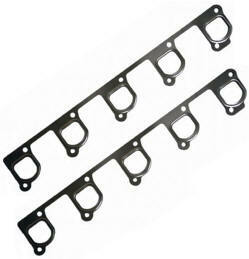 Set of 2 factory exhaust gaskets. Set of 2 factory Intake gaskets. 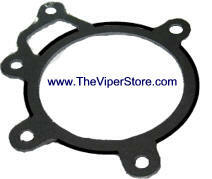 Dodge factory OEM replacement water pump gasket. Dodge factory OEM replacement Thermostat Housing gasket. Custom Multi Layer Gasket direct fit OEM Replacement Oil Pan gasket. OEM Replacement Oil Pan gasket. Dodge factory OEM replacement Valve Cover gasket. Fits both sides. Dodge factory OEM replacement Rear seal gasket . Dodge factory OEM replacement Front Seal gasket.